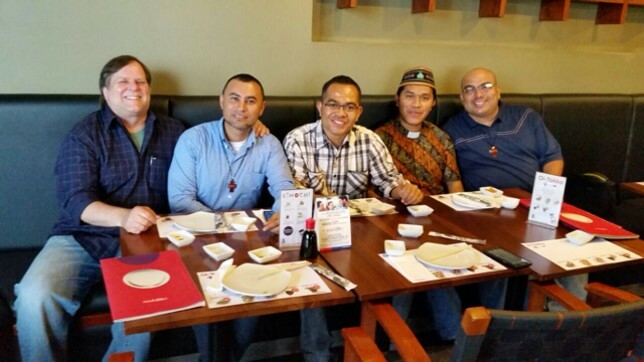 MANAGUA, Nicaragua – Last June 11, 2016, two of our young Indonesian confreres, Fr. Zakarias Beong and Fr. Timoteus Jefriadi Daman arrived in Managua, Nicaragua to reinforce the community of Fr. Alonzo and Fr. Harry. They will be doing missions in two Montfortian parishes, Sto. Tomas and La Gateada. Prior to this mission, Fr. Zakarias and Fr. Jefriadi spent few months in the Philippines to improve their communication skills in English, and another three months in Colombia to learn Spanish. Let us show them our support and pray for the success of our mission in Nicaragua. I am Pat Brennan. I am a former Montfortian seminarian and novice, here in England. I am still very much a Montfortian in my ideals and spirituality. I have worked with Montfortian novices in Uganda as part of their formation, on two of my five visits there. Three of the group I worked with, are now Montfortian priests. At that time, my great friend, Fr Charlie Beirne, SMM, was their novice master in Uganda, but earlier this year he returned to ministry in Malawi. I would very much like to have email communications with some of you, Montfortians in Nicaragua. Maybe I can help you with your written English, as well as share our news together. As you will see above, I have my own website, but I soon want to try and include Malawi where Charlie now is and maybe change my website name to "Pat's Montfortian Mission." It would be great to also include Micaragua on my website. I look forward to hear from some of you in Nicaragua.